I love trivia. My head is full of useless knowledge but I’m always looking to add a little more. In that vein, I love this sort of book (you might not want to play trivia games against me). This book is appealing because of the vast amount of trivia packed into it. Most stories are only a page long, none that I recall are more than two pages long, thus making this trivial in just about all meanings of the word. It can be a quick, easy read, and it’s the sort of book that is perfect for reading in a bathroom (hence the author/publisher). There were a number of pages I bookmarked, finding the tidbit so fascinating (for instance: when 40,000 people showed up in Crush, Texas to watch two trains collide in 1896; or why we say “In a nutshell”). But as much as I love this sort of trivial nostalgia, I can’t help but wonder what sort of research or authenticity goes in to these books. On a page titled “Three Random Origins” is a paragraph for ‘strawberry lemonade’. First … is this supposed to be the origin for ‘strawberry’ lemonade or for ‘pink’ lemonade? Now… I’ve told this story to my own kids. I first read it back in the 1970’s in a Ripley’s Believe It or Not book. I’d researched it back then and the publishers of Ripley publicly noted that they never claimed everything was true … only that you could ‘believe it or not.’ More recently, Smithsonian.com published an article on the history of pink lemonade. The Pete Conklin story that Strange History reports is mentioned, but the article, according to Smithsonian (whom I probably trust a little more for their research than The Bathroom Reader’s Institute) refers to the story of one of two that is most plausible for the drinks’ origin. It’s a fun, if slightly disgusting, origin, which makes it fun to tell (and which is why I have retold it), but it’s not the 100% guaranteed origin. This book gets around the ‘truth’ with this little caveat in the introduction: “The editors at Portable Press have collected thousands of bizarre facts and mind-blowing stories…” They have clearly separated fact from ‘fiction’ (stories). Bear this all in mind … not everything you read is fact, even if it works to promote itself as such … and then sit back and enjoy this trivia. Looking for a good book? 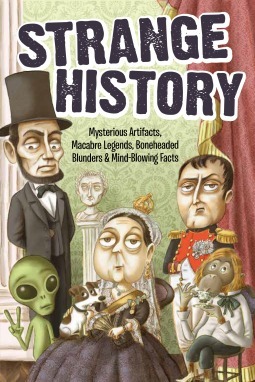 Strange History is a tremendously fun collection of trivia of a historical nature. It will entertain you either sitting in an easy chair in the living-room, or on the porcelain throne in your more private room.